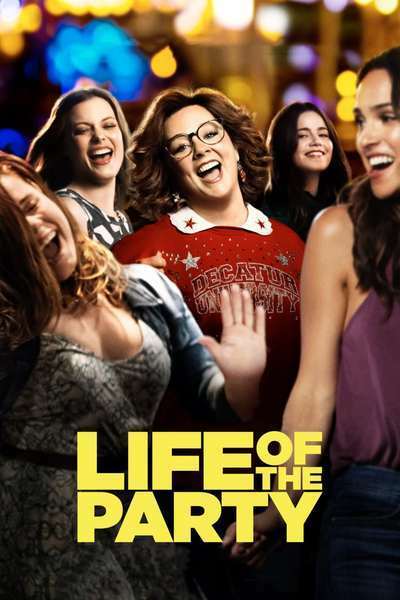 "Life of the Party," about a forty-something divorcee named Deanna "Dee Rock" Miles who goes back to college alongside her daughter, is the latest Melissa McCarthy star vehicle that fails to do justice to the sheer awesomeness of its leading lady. It's essentially a gentler, more sentimental, less outrageous "Back to School," but with a female lead who sees herself as a failure rather than a success, and with consistent messaging about the virtues of sisterhood and cross-generational respect. The movie's concentrated aura of decency is unusual and welcome (college comedies tend to be far more cruel, dumb and sleazy than this), but you still might come away wishing there was more to it. Not more of a plot, necessarily, because from W.C. Fields and the Marx Bros. through Steve Martin and Goldie Hawn, a lot of classic comedies have almost no plot; but bigger stakes, or a dilemma, or more energy; more something. What's onscreen is an airy comic lark that you can take your mom to on Mother's Day—which, granted, was absolutely the point of releasing "Life of the Party" on Mother's Day weekend in the United States. But the film, which was directed and co-written by McCarthy's regular collaborator (and husband) Ben Falcone, is so preoccupied with giving its star's wish fulfillment fantasies that it forgets to make sure all the other major characters seem like characters, rather than underdeveloped notions. Gillian Jacobs’ character, a late-twentysomething known as Coma Girl because she's re-entered college after spending eight years in a coma, is a partial exception: McCarthy and Falcone's screenplay doesn't invest her with many details, but their one good idea is strong enough, and Jacobs is so appealingly not-quite-there that she makes an impression anyway. Dee's agorophobic goth roommate Leonor (Heidi Gardner of "Saturday Night Live"), who seems to be staring at people through a series of dimensional portals, has just the right amount of screen time. And the full-throated heroine-worship unleashed by Dee's best pal Christine (Maya Rudolph) is effective in small, regular doses. But no one else in the cast pops, because they're all pretty clearly there to service the heroine's story and regularly remind us of what a wonderful, resilient and altogether amazing person she is. "Life of the Party" makes its lead character so warm and lovable and indomitable and altogether irresistible that even when life knocks her down, we know she'll get right back up and do the butter churn dance, mangle the language, free-associate, and otherwise do things Melissa McCarthy is known for. The script doesn't place many actual obstacles in Dee's path toward graduation, only speed bumps. And yet, curiously, the movie can't quite go all the way into pure gossamer niceness. It shoehorns in canned elements that signal "conflict" even as they feel as if they've been torn out of previous, equally substandard college comedies. There's a group of mean girls who periodically mock and taunt Dee (adult bullies in these kinds of films rarely have any inner life, or any subtlety; they just sneer and snipe like preteens), but the movie doesn't have the gumption to follow through and really pay the tension off (this subplot sputters, then briefly explodes, then neutralizes itself). Dee gets inducted into a sorority, but after this happens we rarely set foot in the house. She's supposedly so terrified of public speaking that it makes her physically sick, but she'll bust out killer dance moves in a heartbeat, improvise her way out of a tight spot without breaking a sweat, and tell Jack right to his face, with admirable gentleness, that he's wonderful but they're never going to have a real relationship. The blithe inconsistency of Dee's character wouldn't be an issue in a film that wasn't built almost entirely around her. But this one is. McCarthy is a flame-roasted marshmallow, both sweet and searing, operating in the same absurdist danger zone as male predecessors like John Belushi, Steve Martin and Jim Carrey, and carrying movies across the box office finish line on charisma and physical skill alone. She's got a few great moments here; I'm particularly fond of the face she makes during her sorority initiation, which might've terrified Edvard Munch. And the party at the end is fun. But ever since she stole "Bridesmaids" and became American cinema's first zaftig superstar, McCarthy's solo work has been hit or miss: more miss, unfortunately. The problem is focus and ferocity. As long as McCarthy is starring in a film with a clearly delineated concept, like "Spy," sharing slapstick duties with equally brilliant colleagues (as in the "Ghostbusters" remake), or mixing things up by giving a more low-key, realistically shaded performance (as in "St. Vincent," a so-so film rescued by its cast), she's terrific. But when she's just filling up time by doing stuff, as she is here, she never transcends mere likability, and the end product feels like a waste of her time and ours. She's infinitely better than her material here, and because she supplied the material herself, there's only one person she can blame.